Valtteri Bottas was on fire in Australia. He grabbed the lead at the start and dominated the race in his Mercedes. His main rivals, meanwhile, had various woes. Here's how his victory unfolded. Lewis Hamilton started the 2019 season the same way he finished the 2018 season – on pole position in his Mercedes. But while he won the last race of 2018, he was destined not to win the first round of 2019. Bottas shared the front row of the grid with Hamilton. Row two consisted of Sebastian Vettel (Ferrari) and Max Verstappen (Red Bull). Charles Leclerc (Ferrari) and Romain Grosjean (Haas) were on row three. Only once in the previous seven years had the pole driver won the race in Australia. Hamilton, who had started on the pole in Melbourne the previous five years, therefore, had the odds against him. When the red lights went out to start the 58-lap race Bottas made a clean getaway to take the lead while Hamilton faltered with wheelspin. "Probably too engaged with the clutch," Hamilton said. 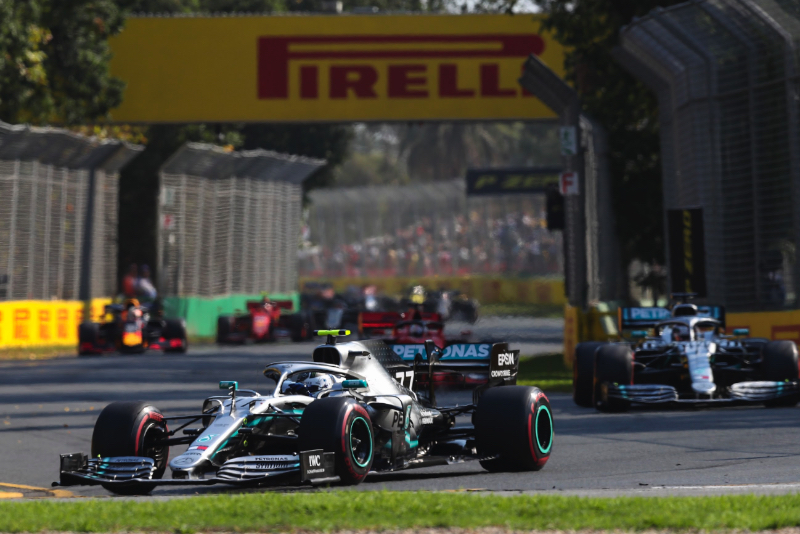 "The key thing for me was the race start, to get to the lead and then being at the front I could show strong pace and I could pull a gap," Bottas said. Further back two things happened that would have consequences for Hamilton. Daniel Ricciardo went off on the grass and tore the front wing off his Renault. Then Robert Kubica and Pierre Gasly collided. The incidents left debris on the track that damaged the floor of Hamilton's car. "I wasn't entirely happy with the balance I had but it wasn't the end of the world," Hamilton said. Verstappen led the other laps in his Red Bull Honda when Bottas made his pitstop. Verstappen, who had passed Vettel, would go on to finish third. "We had a little advantage with the tires but it was satisfying to pressure Lewis even though I couldn't get quite close enough to overtake him," Verstappen said. "The car was working really well and we also look strong on the straights which is hopefully a good sign for the rest of the season. I heard this is the first podium for Honda since 2008 so I am very happy that I managed to achieve this for them today." The Prancing Horse Ferrari team didn't have the speed it did in preseason testing. Vettel and Leclerc would finish fourth and fifth. "We were not happy with the car the whole weekend but today we struggled a lot," Vettel said. "The reason I was so slow in the race was mostly due to the fact that the car could not find enough grip with the medium tires that we fitted at the pit stop." Ferrari issued its first team orders of the season. "Towards the end, I closed on Sebastian, but the team decided to keep our positions, given that the top three places were not within our grasp today," Leclerc said. Bottas was definitely not struggling. "As a team, in practice we saw that we were strong, both in short runs and long runs," he said, "but obviously it's impossible to draw a proper conclusion but we saw the raw pace yesterday in qualifying, as a team, with a good margin to Ferrari, and today race pace was strong – much stronger than we expected coming into this weekend. That's obviously good news. It shows that we have definitely done all the right things between the testing in terms of direction with the car. Also, for myself, it was definitely the best race I've had in my life." The icing on the cake for Bottas was getting the bonus point for clocking the fastest race lap. "It's a point and if you get three of those or more it's going to make a big difference at the end of the year," he said. "You never know. One point can make a difference in the end."